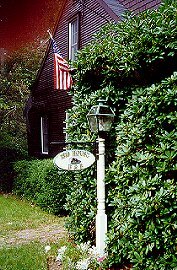 The 1810 House is a comfortable bed and breakfast home lovingly restored and added to by the owners, Harold and Susanne Tuttle. The antique "half-cape" with its original beamed ceilings, three working fireplaces, wide pine floors and hand stenciled walls was recently featured on the Christmas tour of Norwell homes. The house is furnished with antiques, beautiful oriental carpets and interesting accessories collected over a period of many years. Three bright, cheery rooms - one with a canopied bed, one with twin beds, and one with an antique spool bed - share two full baths. The two rooms on the second floor are ideal for two couples traveling together or for families. 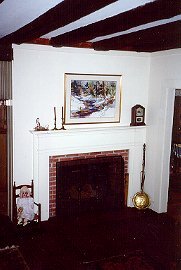 A full New England breakfast is served by the kitchen fireplace or on the screened porch. Norwell, a beautiful historic town, is located halfway between Plymouth and Boston on Massachusetts' South Shore. It is an ideal spot for day trips, with Cape Cod, Newport, Rhode Island, Concord, Lexington, Salem and Rockport all a short drive away. Public transportation to Boston via subway or commuter boat is nearby. A tour of the area in Harold's restored 1915 Model T depot hack adds to the feeling of a bygone era and is part of the fun of staying at the 1810 House Bed & Breakfast.